A denture is a removable replacement for missing teeth and adjacent tissues. If you’ve lost your teeth, whether due to injury, tooth decay or gum disease, dentures are an option to replace them. Dentures can restore your way of life by helping with day-to-day functions such as eating and speaking. Dentures also provide support for facial muscles. 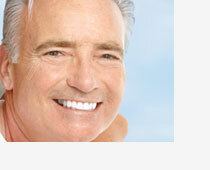 Complete dentures replace all the teeth and they are made using your mouth as a model. Partial dentures are replacements for missing teeth, and they prevent other teeth from changing position. The denture process takes about 6-8 weeks. First, an impression of the upper and lower teeth of the mouth is taken. The impressions are then sent to a dental laboratory to make a model of your jaw. Usually a wax try-in of the denture is done in order to make any necessary adjustments to assure satisfactory fit and appearance before the denture is sent back to the laboratory to be completed. A new denture may feel awkward and bulky for the first few weeks. Your mouth will eventually become accustomed to wearing it. Inserting and removing the denture will take practice but the denture should easily fit into place. Do not force the denture into position by biting down because it could bend or break the clasps. Remove and rinse dentures after eating. Run water over the dentures to remove food and other loose debris. Placing a towel on the counter or in the sink will keep the dentures from breaking if you drop them. Clean your mouth after removing your dentures. Use a soft toothbrush to clean your natural teeth, your tongue, and your palate. Scrub your dentures at least daily. Gently scrub dentures using a mild soap or dishwashing soap and a soft toothbrush to remove food, plaque, and other debris. Avoid using stiff brushes, strong cleansers, and harsh toothpaste because these can damage the dentures. Handle your dentures carefully. Be careful not to bend or damage the plastic or the clasps when cleaning the dentures. Soak dentures overnight. Most dentures need to be kept moist in order to maintain their shape. Place the dentures in water or a mild denture-soaking solution overnight. Ask your dentist about proper overnight storage for your dentures. Rinse dentures before putting them back in your mouth, especially if using a denture-soaking solution. These solutions can contain chemicals that cause vomiting, pain or burns if swallowed. Schedule regular dental checkups. Your dentist will advise you about how often to visit to have your dentures examined and cleaned. The dentist can help ensure a proper fit to prevent discomfort and slippage. Loose dentures can cause irritation, sores, and infection.